Every year as summer approaches and the days begin to heat up I marvel at the beautiful orange explosion that protrudes from an unkempt patch of daylilies and Queen Anne’s lace that was once (BC – before children) a more kempt flowerbed. The butterfly weed (Asclepias tuberosa) that produces that orange glow is a rescue from years ago when I worked for a landscaping company. I came home one day with a single stalk, with hardly any root ball leaning over in a small container. I quickly plopped in the nearest open spot not sure if it would respond or not. The fact that it is not only still there but has, in fact, muscled out a little larger space attests to its tenacity. This tough, native wildflower adds splashes of color to gardens and landscapes from eastern Canada to Florida, west to the Great Lake States, across the prairies of the west and southwest on to California. There is a little square in the northwestern part of the U.S. that dips down to include Nevada where butterfly weed is absent. It grows throughout North Carolina but may be more common in the piedmont and coastal plain than it is in the mountains. It does, however, occur in the mountains. It is found on drier sites in open fields, along roadsides and in woodland margins. These tough, colorful, drought resistant plants are a great addition to any wildflower garden. The flowers are long lasting, starting in late spring and lasting well into summer. Their drought resistance makes them ideal for xeriscaping and butterflies and hummingbirds love ‘em. In fact, it was butterfly activity that drew my attention to the butterfly weed. The flowering area on the clump of Asclepias in my yard is around 1.5 feet in diameter. I counted eight butterflies nectaring on this clump at one time. There were four pipevine swallowtails and four great spangled fritillaries. 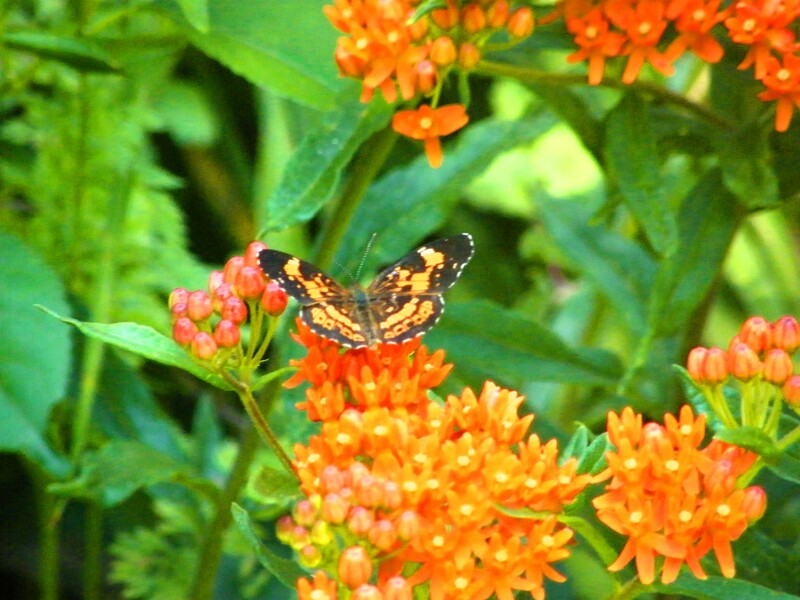 Butterfly weed generally grows from 1 to 3 feet tall. The flowers are produced terminally in a kind of flat inflorescence called a cyme. There could be as many as 15 individual flowers in a cyme. The unique flowers consist of five petals pointing down (reflexed) and five hoods pointing up. The flowers can range in color from a washed yellow to almost red, mine are a deep orange. Asclepias tuberosa is in the milkweed family, Asclepiadaceae and like most milkweeds serves as a host for monarch butterflies. It differs from most milkweed by the color of its flowers, yellow to orange-red; most milkweed flowers range from greenish white to rose; by the fact it has alternate leaves where most milkweed has opposite or whorled leaves; and by the fact that its sap is watery and translucent rather than dense and milky. The literature says it can be propagated pretty easily from seeds and every spring when I see it bloom I think, “I’ll collect some seeds this fall.” And then every fall I watch the large milkweed seedpods rip open and see the wind carry the seeds off attached to billowy silken threads. Ah, but there’s always THIS fall, right?